I didn’t know a thing about Pixel Noir or developer SWDTech Games before hopping into this preview beta. I wasn’t particularly sure what to expect, I’m not a huge fan of JRPGs. I’ve never had the patience for them really. But, I came away from my short time with the game thinking that Pixel Noir might be a must-buy when it finally does release. It does so much right with its aesthetic and presentation that it’s hard to put down. There’s always something to do, a case to crack, or some dumpster coffee to find that keep things interesting. I always wanted to see what was around the corner. SWDTech Games has put together a really cool, slick, and surprisingly dark world that I think will strike the nerve of quite a few gamers. Pixel Noir is a kickstarted game that doubled its initial goal. After listening to the developers Kunal Majmudar and Len Stuart as guests on Nintendo Duel Screens, I knew I just had to give this game a shot and see what it was all about. Now…I’m not gonna walk through the beta from open to close or give you detailed descriptions of every interaction I had in the world of Pixel Noir; I’d rather you experience it for yourself at some point. Instead, I’m going to give you a few of my negative and positive takeaways from my short time with the game. 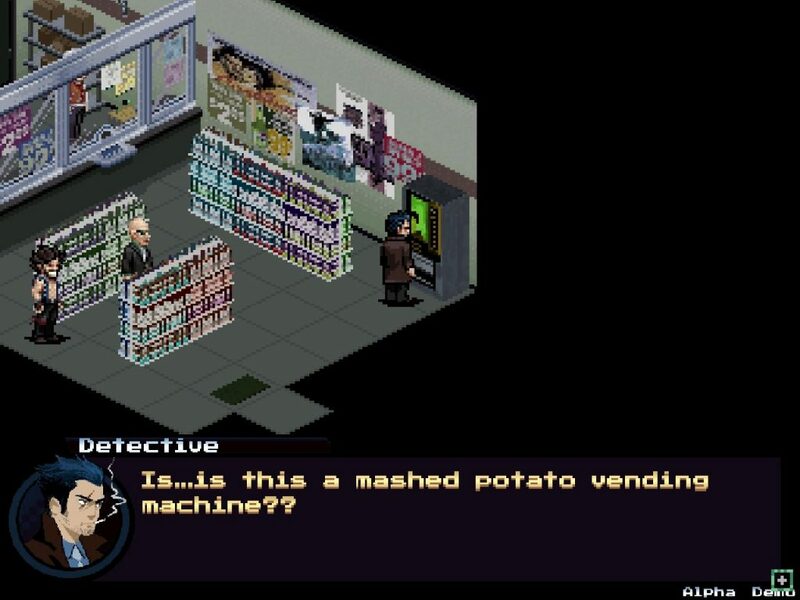 The first thing that stood out to me about Pixel Noir was the artstyle. That gritty, smokey noir feel isn’t something I would normally associate with pixel art but SWDTech Games has really knocked it out of the park. They did a great job encapsulating the grime of a crime ridden city being illuminated by neon lights; The subtle constant fear that comes along with dimly lit city docks and back alleys. The character portraits and dialog are full of character. I felt this mixture of Frank Miller’s Sin City with some deranged demonic pulses of the first few Max Payne titles. Between the comic throwbacks and other-worldly manifestations are some more lighthearted comedic nods that had me chuckle out loud a few more times that I’d have expected from such a dark title. The first time I went into the game’s “detective” mode to search my surroundings was a particular highlight. There’s this fuzzy graying effect that’s coupled with a booming silence and it really nails the insane ticks of a detective’s attention to detail. It makes you feel like you’re on the cusp of a mental breakdown while you’re searching for clues. This level of dedication to art seems to permeate through out the entirety of Pixel Noir. One thing that’s always bugged me about traditional style JRPGs were how endless and unorganized all the menus seem. Unfortunately Pixel Noir could use some tweaking in this respect. Items are kind of just all shoved together in a list that eventually went far past what was visible on screen. Searching through this kind of a list for a specific Item can be a chore. There’s zero organization. Your main and side quests suffer a similar fate. They’re shoved into your “Cases” menu in the order that you pick them up. This sub-menu can fill up rather quickly and get a bit overwhelming. I feel like this information overload is more a symptom of the genre as a whole than of Pixel Noir itself. Luckily, Pixel Noir is in early access and has more than enough time to make changes. 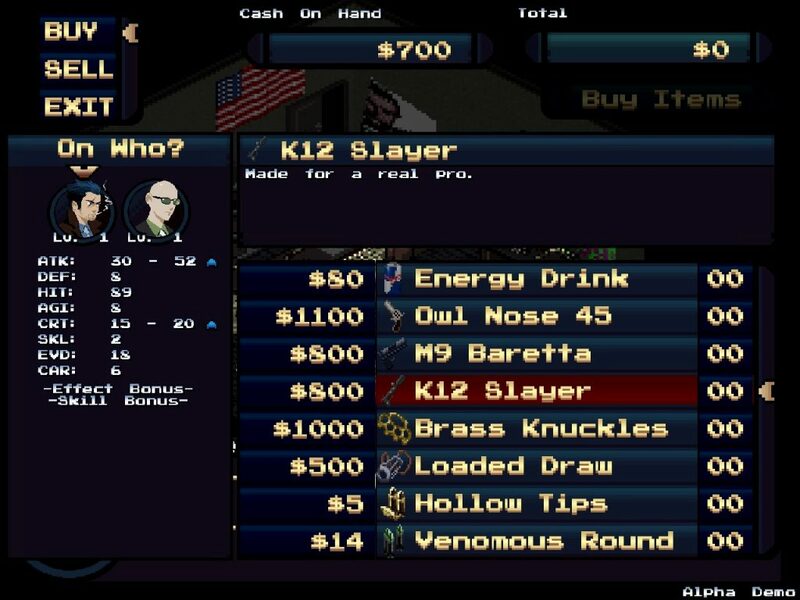 I’d love to see some kid of “Sort By” Feature added or some kid of sub menu for different item types and a way to sort quests. The music in the game is a total standout. If you like bit chip or the sweet nostalgic tones of the NES and SNES in general this soundtrack will be right up your….Alley. Composer Kunal Majmudar nails the feel of the era Pixel Noir takes inspiration from and wedges it perfectly into a noir frame. I was bobbing my head along to all the battle music and the other area specific tracks; So much that I ended up listening to the, hopefully unfinished, soundtrack on a pretty regular basis the weeks after I played Pixel Noir. It can’t be understated how much this adds to the overall feel of the game. It cashes the check the visuals signed. Hell, it even won an award for audio at MAGfest 2017. The Cannery Theme and The Ballad of Vance Royale are particular favorites. I’m looking forward to listening to whatever other music comes out of the final product. If it’s anywhere near as good as what I’ve already heard I’ll be rocking it pretty regularly. As I stated at the outset of this preview, I’m not huge into JRPGs. Call me a blasphemer but they’ve never really been my thing. Pixel Noir does a great job of giving me a reason to play a genre I’ve often found to be boring and not very engaging. 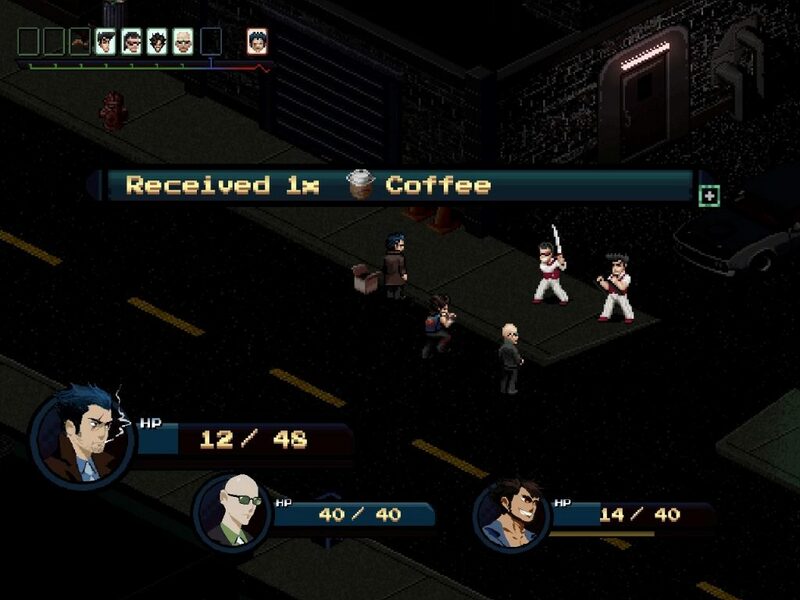 Don’t get me wrong, Pixel Noir does retain some of the turn-based tropes of JRPGs. It’s just that the rest of the game is so well put together that I’m willing to deal with the tedium of traditional turn-based gameplay. The balance that it finds between investigation, exploration, and combat make for impressive for a first outing for SWDtech. The more I play the more positive I am that almost anyone will find something to love about Pixel Noir. I’m amped to see what more they add to the game by the time it hits full release later this year. Like most other people here I'm a lifelong gamer. I have a soft spot for retro indies but will play just about anything if it pulls me in enough.